There is more to the business of global warming than meets the eye. Some companies are bastardizing sustainability simply to reap a profit. Business opportunities associated with climate change are increasing as are profit opportunities for businesses focused on sustainability. However, a new book shines light on the cynical underbelly of climate adaptation. 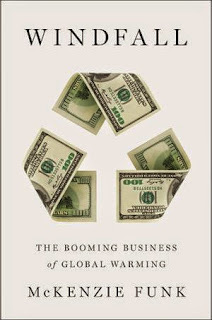 The book is titled, "Windfall: The Booming Business of Global Warming". Journalist McKenzie Funk spent six years traveling the world gathering information to write the book. Funk's book exposes companies that position themselves to profit from a warmer world. Such opportunists welcome climate change as a gateway to tremendous profits. He cites, Deutsche Bank's investments in climate mitigation technologies while pointing out that their "Climate Change Fund," includes companies that are banking on a warmer world. As explained by Funk, "the warmer the world...the bigger the windfall." Funk also reviews companies that are poised to exploit resources being exposed by melting Arctic ice. Vast sums of money are being invested in adaptation. The sinister inference in the book is that some companies have a vested interest in a warmer world. Adaptation efforts in the absence of mitigation should be met with skepticism. We must not allow ourselves to make the false choice between adaptation and mitigation. It is not an either or proposition. We must both curtail our emissions and prepare for the consequences of climate change. The book points to the glaring injustice of the world's poor many of whom will be disproportionately impacted by climate change. This is the win-loss scenario, in which some benefit while others lose. Sustainability efforts cannot be divorced from social impacts. Exploiting profits at the expense of the environment and people misses the point completely. Business which is premised upon the suffering of others is patently unsustainable not to mention unconscionable. These amoral profit oriented ambitions are an anathema to the spirit of sustainability. The calculus behind sustainability implies that a successful venture must benefit people, the planet and profits. In isolation, the profit motive serves the same soulless enterprise that created the climate crisis in the first place. Value in the context of sustainability prioritizes people and the planet alongside profits. Sustainability is premised on the notion that we succeed together, if we fail to meet this challenge we invite catastrophe. It should be no consolation that profits may insulate us for a time, as these short term profits will ultimately give way in a world ravaged by climate change. Investors should be wary of those firms who are banking on the win-loss scenerio. The smart money should go to those who see the long term value of win-win scenerios. The business world is rife with examples of Greenwashing. Such companies seek to profit from climate change under the guise of sustainability. Unless we hold corporations and governments accountable, we can expect this trend to continue. To do this we must delineate those who feign sustainability but are only interested in profits, from those who strive to profit by earnestly practicing sustainability. It is facile to reduce this discussion to the simplistic polarity of good versus evil. Funk's book calls us to deeply explore the value equation upon which a business is premised.